With the disappearance of Scion brand from the market, many good and well-liked cars were set to be relegated to the bin and one of these was the Scion iM hatchback. Luckily the car was good enough for Toyota to take up the model as one of its own in the U.S. and has added it to their extensive Corolla lineup under the name of the Toyota Corolla iM, and it promises to be a popular model for the automaker. It remains feature rich, retains the funky styling and most importantly, the good pricing – all wrapped up with Toyota’s brilliant backing and warranty. Inside the Toyota iM things look good, you can see you’re in an affordable car but that doesn’t necessarily mean things are cheap. There are hard plastics used, but they work with the look and feel of the cabin and the almost minimalist look to the dash and center console. The multifunction steering wheel is chunky and feels good in hand, behind that there’s the instrument cluster with separate surrounds for the main gauges with a 4.2-inch color info screen between them, it does look a little odd but not bad. Space is good in the iM, you’re basically looking at a cabin in a Corolla in terms of seating with space for 5, but the trunk is larger with 20.8 cu-ft. of cargo space. There are very few options to consider for the Toyota iM, it’s one of those what you see is what you get cars. The seating is only available with cloth fabric, although you may find leather and trim options available at dealership level. The Toyota iM is made to be an affordable people carrier and it does this job well. The available power won’t win any races, but it’s more than enough to keep up with traffic and overtake when needed. The suspension is hard but compliant, but it’s not too uncomfortable. There is an option to stiffen it up even more with TRD sports springs. Steering feedback is muted but the there’s not huge power on tap to make this a concern. The 6-speed manual transmission is good and gets the power to the front wheels with smooth and purposeful shifts. The iM can be had with a continuously variable transmission with 7 “speeds” to it, but this should really only be optioned by those who’ve never used gears before. It does a good job of course because it’s a Toyota after all. The whole combination offers good mileage though, with 35 mpg claimed for highway use (36 for the CVT). 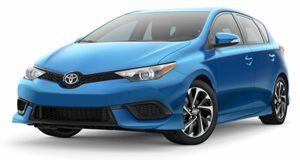 As seen in the Scion iM, the Toyota iM features the exact same normally aspirated 4-cylnder engine. The power is also identical with the 1.8-liter engine producing 137 hp and 126 lb-ft of torque – this unit sends power to the front wheels only. This power is best used with the 6-speed manual transmission that provides a good, solid feel when changing gears. A continuously various transmission is an option and while these are never really great, in the Toyota iM its not terrible. The 7 “shift points” make it feel more like a conventional automatic transmission but it’s still a CVT. There’s not race-winning power, but it’s enough for a reliable daily driver. Toyota models usually have good safety and the iM is no different. The airbags in the Toyota iM include a pair up front for the driver and passenger, and there’s also side airbags and curtain airbags as standard. The iM also features ABS and traction control as standard, along with a rather sensitive lane departure warning system, but that’s really where things end. The 7-inch screen heading up the infotainment is standard too, and good enough for most, but it doesn’t have dedicated support for Apple CarPlay or Android Auto – tunes will need to be Bluetooth streamed. What you have with the Toyota iM is a good front-wheel drive hatchback that has a decent amount of features included as standard wrapped up in some decent-looking styling. Its fast enough, reliable and most importantly, it’s not going to break the bank. The only real difference between the Toyota and the Scion iM is the badge on the front; it’s otherwise a carbon copy. If you’re in the market, the manual transmission is where you would be happiest spending your money.